First off we need to clarify that very few unitary manufacturers use flares anymore. You will most often find flares on ductless and VRF / VRV systems and in refrigeration. A flare uses a flared female cone formed into tubing (usually copper) that is pressed onto a male cone (usually brass) by a threaded flare nut. A flare shouldn’t be confused with a chatleff fitting that uses a threaded nut and seals with teflon or nylon seal. This is not a full lesson on how to make a flare, this will give you some best practices to make a flare that doesn’t leak. Use proper depth, the old school method is to bring the copper up a dimes width above the block but modern flaring blocks usually have built in gauges that work well. Ream the copper before flaring to remove the burr but don’t OVEREAM and thin out the copper edge. 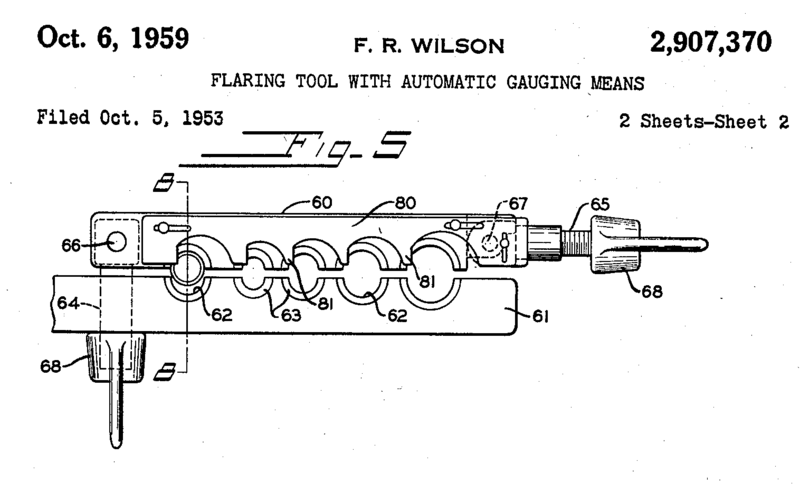 When making the flare use a bit of refrigerant oil, or even a better a bit of Nylog. You only need a drop or two, one drop on the flare while making it to prevent binding and create a smoother flare surface with a bit on the back of the flare as well to allow the nut to slide easily. I also like one small drop on the threads and spread to the mating surfaces. Some manufacturers disagree with this due to the effect it has on torque specs so always follow their recommendations when in doubt. In my experience a bit of assembly lubricant really helps. Use a flare wrench instead of an adjustable wrench and tighten with a torque wrench. I understand that very few techs do this… but it is a great practice if you want to get it right the first time with no leaks and no damage. This can be done easily be done with a set of SAE crowsfoot flare nut wrenches and a 3/8″ torque wrench. As always use manufacturers torque specs if available. If not you may use the chart below. Make sure to keep the crowsfoot at 90 degrees to the wrench (perpendicular) and place your hand on the end grip of the wrench. If you have lubricant on the threads stay on the low side of the torque rating. Using these practices we have VERY FEW leaks on flare fittings. There is a company called Spin that uses a flaring tool that goes on a drill. Their tool actually heats and anneals the copper. They claim they don’t need to get the flare to 45 degrees because the annealing makes the copper soft enough that the nut itself with finish the flare. We have used it a few times with good results. There are now companies that make nylon / teflon (I’m actually not sure what they are made of) gasket inserts that go into a flare. Some techs swear by them, I really don’t see the necessity but I don’t have any experience with them. Finally, make sure when your system has flares to pressure test to the rated test pressure and bubble test the joints. Then perform a vacuum to below 500 microns and decay test. This will help ensure that you got it right. If it leaks, cut it off and remake it. Technical Order TO 32B14-3-1-101 Operation and Service Instructions Torque Indicating Devices gives detailed use of torque wrenches and screwdrivers. Use of a crowfoot will require calculation of the required torque setting of the instrument for the required torque. The TO also shows the required torquing pattern. A search for PDF TO 32B14-3-1-101 should give you access for download. The publication has been approved for public release. My understanding the flare used on a mini split is actually a 37degree and not a 45 degree. If you use a mini split kit from Diakin or CPS your torque wrench is included. Use them and your leaks will come to an end ! Promise ! R410a flares are 45 degree, including mini-splits. The face of the flare is also slightly bigger so there is more surface area between the flare nut and the male cone. This is why mini-split manufacturers specify a 410a flaring tool. A drop of 410a oil or Nylog on the mating surfaces is key to keep from twisting the tubing as you torque it. If you do not use the oil, you run the risk of the joint “untwisting” slightly which leaves a loose flare and a leak. Torque wrenches are also a must, if you want to do the job right the first time. Never use the flare that comes on the line set, cut it off and do it right. Same goes for the flare nut on the line set, remove it and use the flare nut that comes with the mini-split. If you ever need to “flare couple” a line set, use 410a forged flare nuts for best results. The other option is to nitrogen braze the line sets together.